SUN VALLEY, CALIF. (February 28, 2019) – Los Angeles City Council member Nury Martinez ‘flipped the switch’ today on the largest rooftop solar interconnection in Sun Valley, which will eventually result in 4.3 million pounds of carbon reduction, the equivalent of making approximately 1,000 homes carbon-free. The installation is the latest building to take advantage of the CLEAN LA Solar program—also known as the Los Angeles Department of Water and Power’s (LADWP) Feed-in Tariff (FiT) program — which allows commercial property owners in L.A. to take advantage of thousands of acres of underutilized rooftop space by generating energy through solar panels and selling it to the LADWP at a competitive fixed rate. The result is zero-carbon, renewable energy that also supports jobs and fuels private investment. The 2.6-megawatt Sun Valley project was developed and installed by PermaCity Construction Corp with subcontractor PermaCitySkyBridge and Stronghold Engineering, Inc. Project construction led to 40 local jobs, many of which went to veterans, and included training on solar installation procedures. The building developer and owner, Xebec, has also been a longtime proponent of developing environmentally friendly and energy efficient industrial real estate. Also instrumental in the installation of the Sun Valley FiT and other renewable energy generation programs in the Los Angeles area is the Los Angeles Business Council (LABC). Wells Fargo’s grant will support the group’s plan to create 150 new local jobs and generate at least $5 million in new private investment through the installation of five megawatts of rooftop solar. These new solar initiatives address a serious need in Sun Valley, where there are higher unemployment rates and lower than average incomes than other areas within the City of Los Angeles. Negative health outcomes from pollution exposure, such as acute respiratory and circulatory illness, are exacerbated in the Northeast Valley, with the area scoring in the bottom 25 percent of clean air in the state, and a childhood asthma prevalence 20 percent higher than the state average. Today’s solar installation celebration included community members, local property owners, solar providers and clean energy advocates interested in the benefits of the solar FiT program for Sun Valley. Martin Adams from LADWP, Jonathan Port of PermaCity, Henry Pfirrmann from building owner Xebec, and Robin Choi from Wells Fargo made remarks at the community celebration. XebecTM is a privately held real estate investment platform that provides vertically integrated and full-service real estate acquisition, development, ownership, financing, leasing, property management and real estate investment management services. Xebec focuses on fulfillment, warehouse and distribution centers (bulk logistics), light industrial and infill/last mile properties located primarily in U.S. coastal and inland logistics markets with major port and rail terminals, and trucking intermodal infrastructures. Xebec has over 30 years of industrial real estate development and investment operations. Xebec also manages Xebec Industrial Trust, LP, a stabilized portfolio of core institutional quality industrial assets. For more information, visit https://xebecrealty.com/. Since 2003, PermaCity works with public facilities, real estate Portfolio owners, and business owners to convert unused roof assets into revenue while contributing to a sustainable climate, reduced heat island, and elimination of local air pollution. PermaCity provides project funding from a dedicated $250M solar fund for FiT, PPA, ESA, and Leasing. 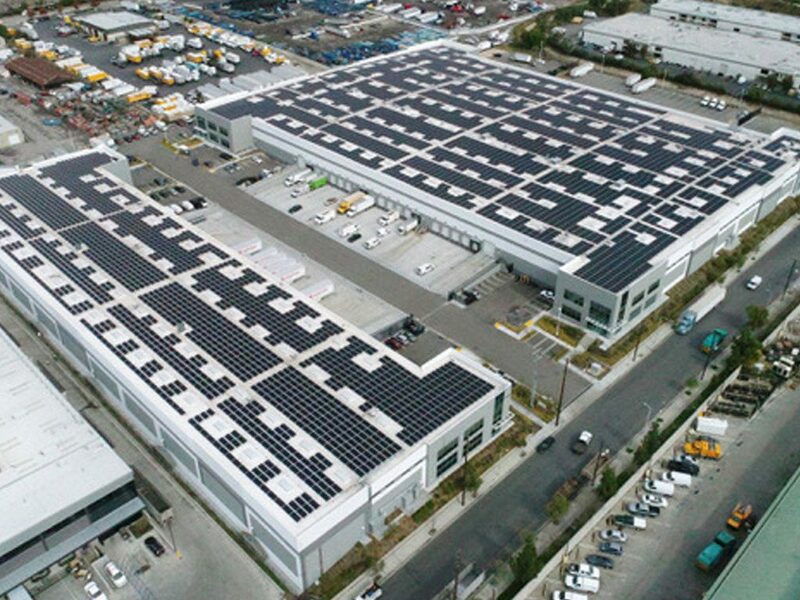 PermaCity is the largest commercial solar developer and installer in Los Angeles with more than 100 MWs installed and operating on more than 9 million square feet of commercial roofs, including Westmont Industrial Complex, the largest solar roof in the World at 16.4 MWs, the L.A. Convention Center, Fox Studios, and many others. Affiliate PermaCitySkybride is a veteran focused Union construction company specializing in DC solar roofs deploying PermaCity’s patented SolarStrap manufactured in Los Angeles.